TAMPA, Fla. - Randy Edsall has a message for the rest of the American Athletic Conference, and the country for that matter. Yuck it up while you can. Enjoy the jokes - not to mention the yardage and the touchdowns - at our expense, the UConn football coach says. Because, Edsall insists, he can see his Husky football team taking shape. And that shape is no longer a mere speedbump on the road for UConn’s opponents. It’s not often coaches display the bravado Edsall did Saturday night following an eight-point loss, but the Huskies’ 38-30 loss to No. 21 South Florida at Raymond James Stadium was in some ways a major sign of life for a team and program seemingly on life support. The coach took the opportunity to promise his team’s foes that UConn’s role as pushover is coming to an end. 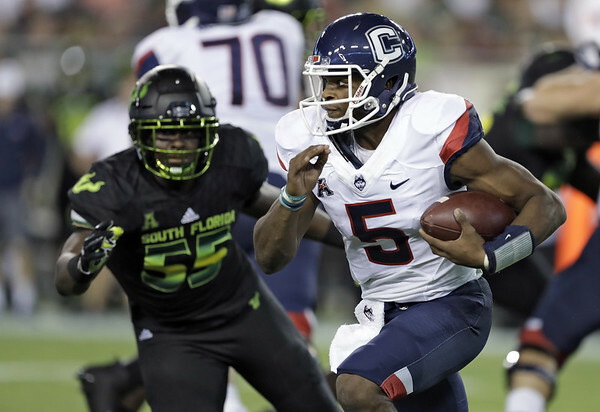 After losing games by 39, 55, 30, 42 and 41 in its first five efforts against FBS competition this season, UConn showed some rare fight. And if it hadn’t been off-sides on an onside kick attempt with 2:24 to play, a boot that UConn’s Keyion Dixon recovered, things may have been really different. The result wasn’t what Edsall or anyone on the visiting sideline really wanted, but the progress the Huskies made in defeat was still worth considering. Maybe even celebrating a little. “Don’t worry. We start putting together what we’re putting together and these guys get bigger and stronger, we’ll be all right,” Edsall said. Two weeks after saying the coaching staff wasn’t exactly looking at the present, Edsall and company were definitely in the moment against Bulls. Playing on the turf of one of their greatest triumphs - Dave Teggart’s 52-yard field goal in the final seconds in the nine years ago beat the Bulls 19-16 and put the Huskies in the Fiesta Bowl - UConn started to turn around what has been a horrendous season. The Huskies, anxious to win for linebacker Eli Thomas after the junior suffered a stroke, came out like gangbusters. Two interceptions in two drives, not to mention three more forced punts, came from a defense threatening to set national records for futility. And an offense that has often struggled to fire on all cylinders for an entire game staked UConn to a most unlikely first-half lead. That would be the Jordan Todman-Kendall Reyes-Teggart era of Husky football that Edsall directed in his first stint in Storrs. USF tied the score at 7 near the end of the first half, but the Huskies were still flying pretty high at halftime. The mirage seemed to end on the first play from scrimmage in the second half when USF quarterback Blake Barnett hit Randall St. Felix with a short pass that the receiver turned into a 75-yard touchdown for the Bulls. The score could have been a turning point in a game which to that point had been the best one the Huskies had played all season. But UConn somehow stuck around. Even late in the fourth quarter as USF continued to score, the Huskies continued to respond. And when Dixon recovered Noah Iden’s onside kick with the Huskies down one score and more than two minutes left on the clock, it appeared the impossible might actually happen. The stunning upset was not to be, but that doesn’t mean the Huskies can’t build on the effort anyway. After all, they haven’t had much in the way of building materials all season. There was no mistaking the Huskies’ intensity on this night, however. Late in the game, when UConn quarterback David Pindell took a vicious shot from USF cornerback Mazzi Wilkins that drew a personal foul, one play after running back Zavier Scott had absorbed a big and perhaps unnecessary hit from the Bulls’ Mike Hampton, a number of UConn players took exception. “Get him outta here!” multiple players screamed from the bench as Wilkins was penalized. UConn offensive linemen Ryan Crozier and Nino Leone took particular umbrage, and decided a few USF defenders needed some face time so they understood such hits would not be tolerated. UConn linebacker Santana Sterling, on the sidelines at the time, took note of his teammates’ actions. “Brotherhoods come together. That really shows it right there. Dudes don’t let their quarterback just go get hit. I saw Ryan Crozier running over there. I saw Nino run over there. They’re letting them know ‘That’s our quarterback’ and I love to see that,” Sterling said. Potential fisticuffs and haymakers aside, it’s a good thing that the Huskies showed some fight. They’re not willing to be punching bags, or listen to punch lines, anymore. Posted in Newington Town Crier, UConn on Tuesday, 23 October 2018 21:22. Updated: Tuesday, 23 October 2018 21:25.